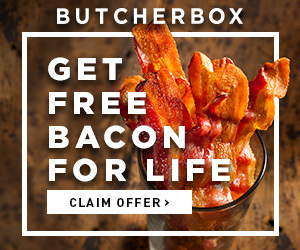 *I’m working with Chicken of the Sea on an advertising opportunity through my ad network, Gourmet Ads. This is NOT a sponsored post from Chicken of the Sea, but it was requested for the advertising collaboration I have my tuna recipe back on the front page, so I’m giving it a re-post! As always, I want to be completely transparent and up front with you guys about what’s going on. I’ve never worked with this type of ad collaboration before, so I’m giving it a try and seeing how it does. 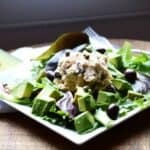 This Mediterranean Tuna Salad is still just as delicious as the first and second time around, so give it a try! April 16th, 2016: It’s Friday, and you know what that means – Facelift time! I admittedly haven’t been regular about my Facelift Friday posts, but I keep re-shooting recipes and fitting them in when I can. 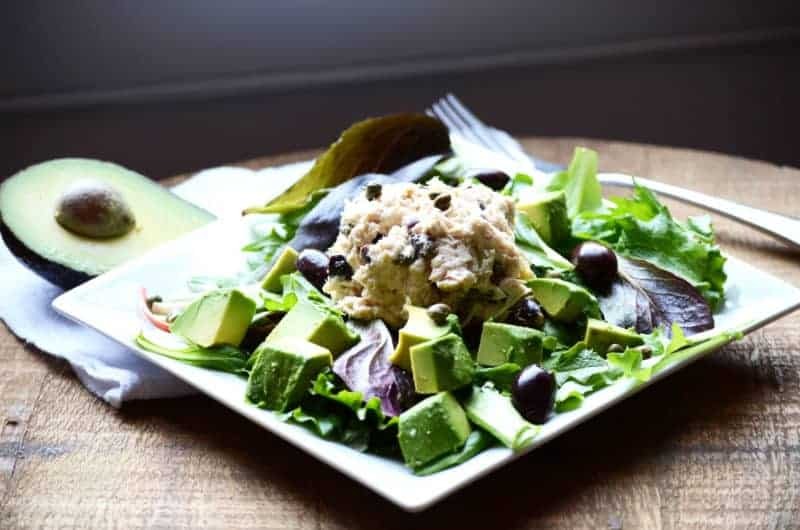 This Mediterranean Tuna Salad is one of those recipes I shot when I first got my camera. I thought at the time I took it it was a good photo, but now that I’ve learned so much more about food photography, I realize that the lighting was all wrong. I shot the original photo with backlighting instead of side lighting, which created all the dark shadows. I hadn’t yet learned about reflectors & food boards, or all the other equipment and science behind taking photos of your food. And here I was thinking I was just going to eat delicious stuff. Speaking of delicious stuff, this mediterranean tuna salad is up there on the list. 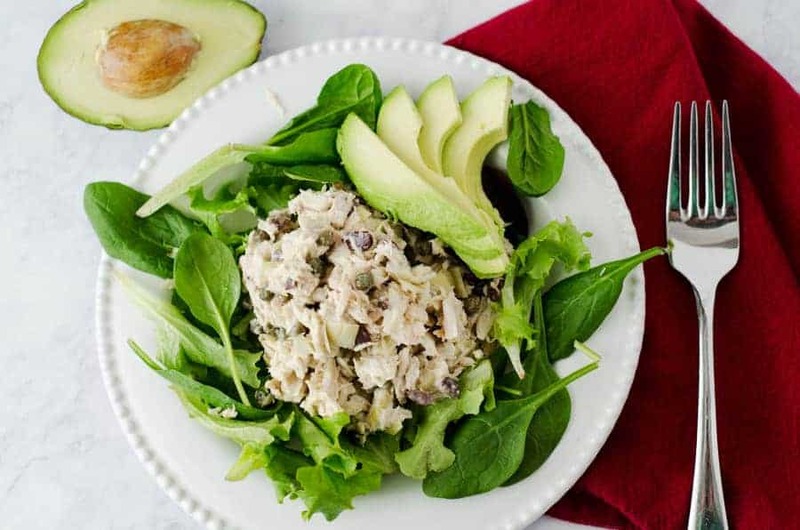 Tuna is a great source of protein, and an easy go-to on Whole30, especially whipped up with some of my homemade mayo. But, it can get boring fo’ sho.’ Throwing some stuff in the mix can liven it up for your tastebuds a little bit, throw ’em a little party. For me, these flavors are my favorite. Sweet sundried tomatoes, sharp kalamata olives, salty capers. I’m always drawn towards really flavorful and spicy things during Whole30. Y’all, don’t get me wrong–I am so glad I took the chance that I did, and I’m 100% certain that it will pay off in the end. That being said, it is a struggle to work on this many things at once. I’m sure that once all of them are up and running, everything will be a bit smoother, and there may be a bit more passive income involved, but right now, it can be summarized in one word–hustle. I’d be lying if I said there weren’t days where I just want to lay on the couch and watch hours of useless television, but I know that won’t get me where I need to go. I’m finding my balance and getting into my rhythm. I’m still working on figuring out how to prioritize things, and how much time things are actually going to take. (In case you haven’t noticed, things are taking more time than I thought, which is why this poor blog has been so, well, quiet lately!) We did get a little shout-out on the Charleston Blog Society page; check it out here! Sometimes, when you’re busy, you just want to throw some ingredients in a bowl and call it lunch. I love tuna, but plain tuna salad gets…well…boring. Just adding a few ingredients packed a big punch of flavor into this one. The fresh avocado makes all the difference, and adds some healthy fat to keep you full longer. Have you noticed how testy those things are? You wait one day too long, and they’re all, “uh uh, I was perfect yesterday, but you waited, so now I’m brown.” I managed to catch this one before he turned his back on me, though. Taking the photo of this one (which I’m still not even happy with) took more time than the tuna salad itself took to make! In a large bowl, combine the tuna & mayo and stir to combine. Add the capers, olives, sun-dried tomatoes, artichokes, and lemon juice. Place a large handful of the spring mix on a plate. 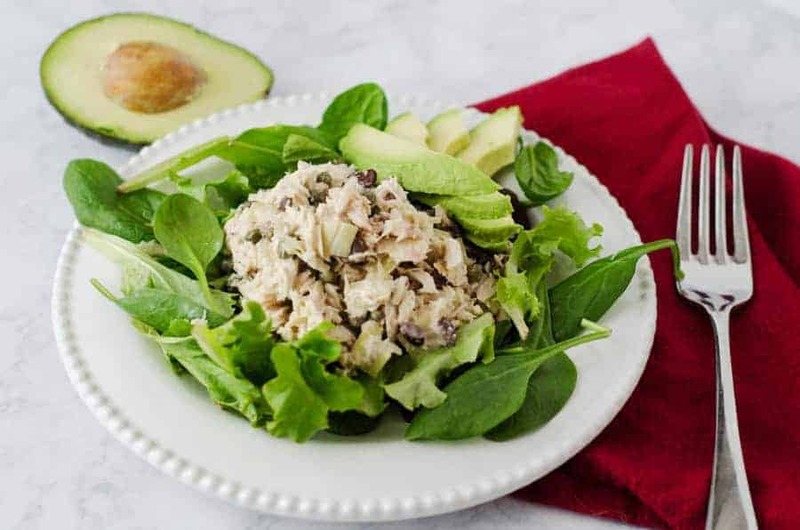 Top with 1/2 of the tuna salad and 1/2 of the diced avocado and serve.